Geopuzzle: What is this rock? I received an e-mail from a reader asking my opinion about a rock they found and, as in previous occasions (e.g., here and here), I figured it would make a good Geopuzzle. I also recommend checking out Andrew Alden’s resources for identifying rocks over at About.com. This one was found near Brandenburg, Kentucky. To be perfectly honest, this one is pretty difficult … I’d like to take a hammer to it to see if most of what’s highlighted in these photos is just surficial. What do you think? Share your guesses in the comments below. I’m putting my money on a thunderegg. Is it a chert nodule? It does have a patterned look to it, but not regular enough to be a fossil. 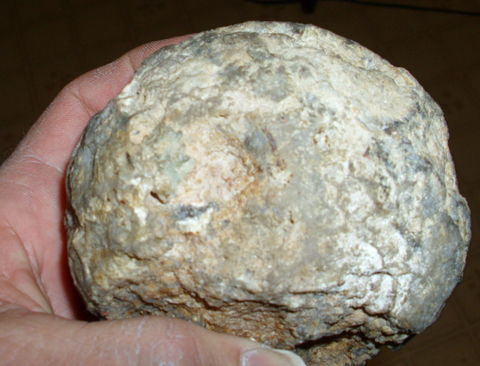 The roundness is not definitive of anything–could be a geode core or a fossil cast. The mineral may be fluorite, considering the location and color, or silica or even opal. We need a scratch test. On the whole I would go with an authigenic, not organic origin. I’m with Ron: Thunderegg or geode. You mean we don’t get to see what’s inside???????????????????????? My first thought was thunderegg, or geode. It looks like agate or other microcrystalline silica on the outside. Both thundereggs and geodes are fairly common in places in the west. I wouldn’t have thought they were common in Kentucky – but Callan doesn’t seem to have a problem with that, so… break it open! 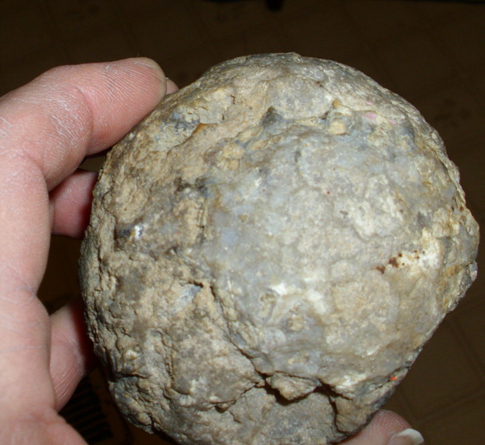 Geodes are very common in the Kentuckiana (northern Kentucky/southern Indiana) region. I can’t imagine someone from this area *not* assuming it’s a geode…. ..late due to the time difference…but.. I would go for silica geode too..
one more for team thunderegg. Or, pretty much anywhere in the state where Mississippian rocks are exposed. Though, not common, beautiful acicular xls of sulfides and sulfates can be found in Ky geodes, so I would encourage the contributor to crack the thing. Be kind to the nice geode – and cut it open with a good rock saw. I am going to try something completely different and just wonder if this cannot be some man-made material. I remember a trick one of my geology professors pulled on us in the first geology field trip I went as an undergrad. As we were crossing a small creek in the S. Carpathians, he reached down and pulled out of the water this nicely shaped and rounded conglomerate-looking rock and asked us “what is this”? Everybody made theses very eloquent and elaborate interpretations. He waited patiently then told us it was a piece of man made material and pointed out upstream to this concrete bridge where this piece originated from. We walked there (he made us walk in the water, to experience first hand the “forces” that round and sort the rocks in a river bed) and, sure enough, we proved the source. So, just a thought, can it be a man-made concoction? I have yet to hear back from this reader … but, perhaps they will be willing to do some hypothesis testing with a hammer! I vote for a quartz intrusion into basalt. I have a similar rock I picked up in Oregon, which was part of the trigger of my career path change from Electronics to Geology. Other than a couple of pegmatites, there are no intrusives in Ky.
I’m with the consensus- when in doubt-use rock hammer. My guess would be it is geode/thunderegg. Rock saw would make a nicer cut if they are worried about damaging it. I’d be too impatient to wait for access to the latter though..
FYI — I never heard back from the reader who sent this in … when/if I do and there is more information to share I will put up a new post. Thanks all for playing! 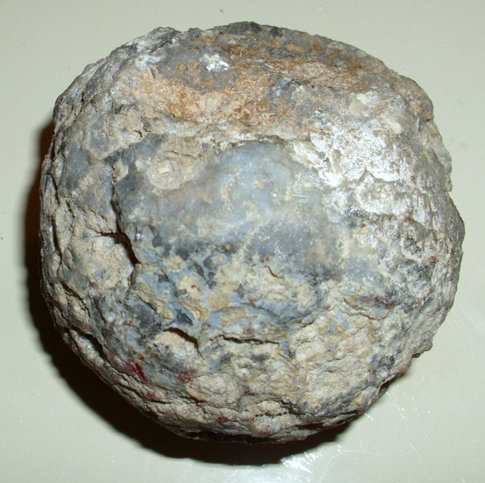 A cannon ball that has been steeping in a chemical stew for a century or so? Its a geode. most likely chalcedony. KY perhaps? So happy to find your site. I am a very amateur geologist. And I came from British Columbia, Canada to Alamogordo New Mexico. I am very interested in the Lake Valley Region, and my house is so full of rocks that myself and my son have collected it’s crazy. So many unusual things here. We have found many small fossils, and these odd round rocks that, when broken open have three or four layers of solid rocks that are distinctly colored. They all seem to have a solid central core. My son calls them ‘rock eggs’. Your site is wonderful, and very helpful to someone like me who has a deep interest and respect in the earth. We would like to see the crinoid fossil that you found, do you know how you got there ? Also, any idea what the rock eggs are ? I’ll try and post a pic. Deborah, I do not know all that much about the Alamogordo area. I’m not sure which crinoid you are talking about … maybe you can link to it? In terms of the ‘rock eggs’, my best guess w/out seeing them is they are some sort of concretion, but that’s only a guess! It’s conglomerate. It is not a thunderegg or geode as we have many where I live and they are very distinct. We have conglomerate from all over the u.s. and this looks like some of the conglomerate that we found in upper washington this past spring. I too live in the Northern California area and would love to go search for geodes with my children. Can you share the location? It’s Amethyst, I know that. It may also be a geode, so crack it open and see what’s inside! It’ll look alot better on the inside. Dear Chopper Mcgone again. I live in New Mexico, i was born in California. We used to find geodes in the St Helena, Angwin, Calistoga areas. But in New Mexico i have no idea. Ok so I know this is an old post but its the best thing I’ve found so far. I have a small rock and I have no idea what it is. I collected rocks as a kid and this was in my collection. We live near Elberton Ga (“Granite Capital of the World”) so I’m suspicious that its some sort of granite. Please please please help! Here is a link to my photobucket album with pictures of the rock. Wow Thank you so much! I believe its chalcopyrite. The pictures of bornite just don’t look quite right. I will inquire with the InquiringRockHunters as well. Thank you for all the information! You’re the best! !